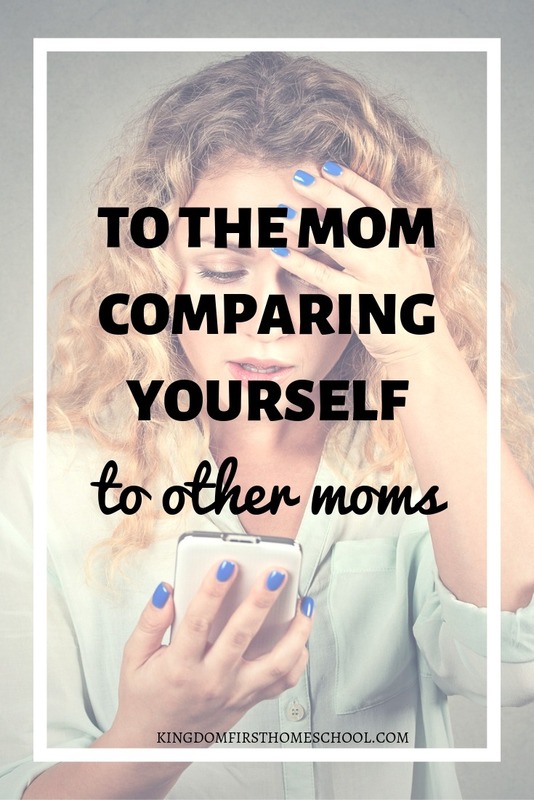 Are you constantly comparing yourself to other moms? Worried about your mom game? Swamped with negative thoughts and doubts flooding in on the REGULAR. Do you cringe at yourself when you see an amazing mom, who SEEMS to have it all together? You are not alone friend. I believe this is one of the most common mom problems and this post is going to end it here and now! Satan uses comparison to steal all joy when you are caught up in comparing yourself to other moms. How does she do all of that and make it look so effortless? She looks so good for 40. Does she even age? How does she have time to do her hair and makeup every day? I barely have time to shower let alone do my hair. Her kids are so well behaved, what am I doing wrong? I know I have a lot. 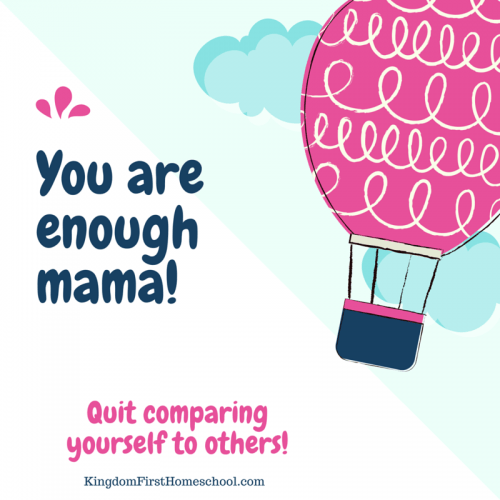 This is for you mom who is comparing yourself to other moms. It’s time to choose happy. I’m going to let you in on a little secret though. Someone else is looking at you, and listening to that same lie while reading your Facebook post, or pinning your perfectly planned out homeschool day. When we compare ourselves to each other, we will always come up short and on the flip side we can never truly be happy for anyone else. We were all created differently. We all have different gifts and talents. But the gifts and talents that someone else has, if you are looking at them through rose-colored glasses, look unreachable and way better than your own. You will find yourself saying negative things about the person to make yourself feel better. But you won’t feel better, you will feel worse. Have you ever said or thought anything along these lines? Tearing others down is not what we need to do sweet friends. We have to stop the comparison and negative seed before it is even planted. Take for instance, the mom who is a really amazing cook and is always baking something up good and yummy. Maybe you aren’t the best at that. Her one gift should not make you feel less than or insignificant. Cause in reality she is watching you and feeling insignificant at whatever your personal gifts and talents are. It is a vicious cycle ladies, everyone feeling like they are missing something because she can’t do what she can do. Listen to me sweet friend. You were meant for great purpose. In the garden of Eden, when satan was tempting Eve, he used this very thing on her. He made her believe that she was missing something. But was she? Absolutely not, she had everything she could ever want. But she still believed the lie and felt insignificant. The rest is history. Satan is still telling women these same lies today. He is trying to keep us in total discontentment. He is spewing lie after lie telling us that we aren’t good enough, we aren’t doing enough for our kids, we will never have a good life – just lies. God has an amazing plan for your life, the bible says that His plans for you are GOOD and not for evil. He is not the bad guy causing all the sickness, disease and calamity. These negative thoughts and ridiculous judgments are not from Him. In myself, I combat these thoughts with the truth. Greater is HE who is in me than he that’s in the world, I can do all things through Christ who strengthens me. If you are saying “this is me, I think this way too.” Then begin today. Start changing your thinking. Go after each thought that isn’t a positive reflection of who you really are. Take every thought into captivity and begin to transform those negative thoughts into positive ones. Did you know that your future begins in your thoughts. Yep, it all begins with that one little negative thought, which leads to speaking it, speaking it leads to acting on it and our actions lead to habits and habits develop our character and our character develops our future. Hmmm… Best to stop it before it even is planted. I just absolutely love to reveal the tricks of the enemy, and share what God has taught me by guiding, encouraging and helping other moms to see their worth and know that they are not alone. Mama, you have to quit comparing yourself to other moms. Another thing that I have noticed is other moms are tearing each other apart and that just isn’t right! If you want to co-sleep and breastfeed, bottle feed whatever until they are 5 who cares, that is you doing what you think is best for your kids. We need to encourage each other and stop tearing each other apart ladies. Fo REAL! We all fail, we all question our parenting skills, but that doesn’t have to define us. We can move past all the lies that tell us we are failing and can boldly stand up and say we are doing our best. And our best is all God is truly asking for. He knows we are human, He created us to have a mind, will and emotions (soul), we need to learn to be led by Him and this starts, by capturing those thoughts, renewing our minds to His Truth by reading the scriptures every day. 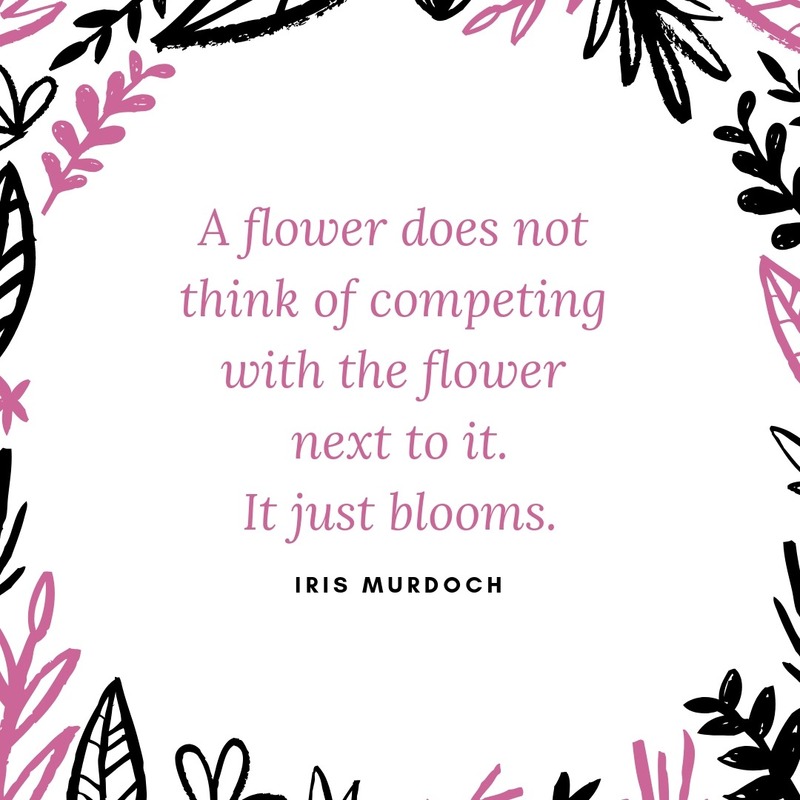 Have you been battling with comparison in yourself? What ways are you dealing with it? Forest, this was so sweet. Of course, you have your finger on the pulse of what we are all tempted to think and what we really need to be telling ourselves each day! Thank you for this sweet encouragement, friend! Glad you were encouraged Lynna!